Ezra Taft Benson was a sharp critic of the civil rights movement and called it a communist conspiracy. Why was that? 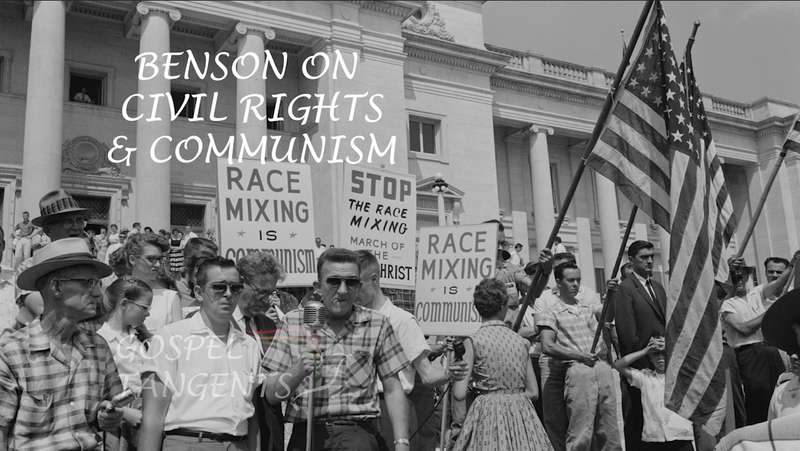 Dr. Matt Harris details the red scare, and why Benson was so opposed to both communism and civil rights. Matt: Elder Benson thinks that Martin Luther King–this is the Birch view, of course, but Elder Benson, following the Birch line thinking that Dr King is a communist agent. That somehow if you push for racial equality, you also want economic equality and that makes you a socialist and a communist. So Elder Benson is furious with Hugh B. Brown’s general conference talk, where the Church is on record as supporting civil rights. Now keep in mind what that means. Brown never said that we favor the civil rights stuff going on in Congress right now. Nor do we favor particular legislation in the State of Utah. There was nothing specific about it. He would write that too, to other Latter-day Saints who wrote him letters. “Does that mean we support the Civil Rights Act of 1963, that John F Kennedy is pushing through?” He’d write back, “We don’t support any particular policy. I just want you to know that we do support civil rights as a general principle.” So clearly, there’s some hedging with him. We will also talk about his European Mission. Matt: …after the whole Harding speech on the floor of the Congress, it created a buzz storm. And the brethren and President McKay [decide] “We’ve got to get Benson out of the country. We’ve got to purify his blood.” That’s what Joseph Fielding Smith says in a private letter. We’ve got to get him out of the country and purify his blood. What he meant by that is purify his blood of politics, of Birch. In 1963, ironically enough, the same month that Hugh B. Brown is giving that civil rights statement in conference, Elder Benson’s going to get summoned into the First Presidency’s office to be told that he’s going to be sent to Germany to preside over the European mission. Dr Matt Harris explains why Ezra Taft Benson tied the civil rights movement to communism. Don’t forget our other conversations about Benson! 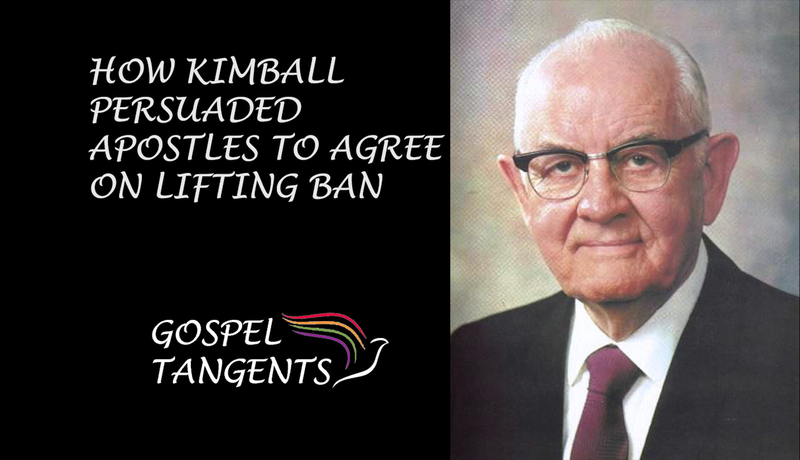 In our next episode with Dr. Matt Harris, we will talk about how President Kimball persuaded the apostles to lift the priesthood and temple ban on black church members. It turns out the Brazil Temple was a key part of that, as well as Bruce R. McConkie’s change of heart. Kimball knows the consequences of doing something unilaterally without quorum buy-in. He sees that in church history, and he experiences it himself during the McKay administration. So, President Kimball recognizes this is such a delicate task, and that if he is going to make this, arguably, probably the most momentous—not arguably. In the 20th century, it is the most momentous decision in the church, second maybe only to plural marriage, giving black people the priesthood. So, he knows he has to have buy-in. How do you get buy-in from people who have very, very deep-seated racial views? President Kimball announces the Brazil Temple. This is a bulwark to help the brethren to come along with this. He recognizes that you can’t have temple in this heavily bi-racial nation, where the people who sacrificed and do so much to build the temple are shut off from it. I mean he understands this. 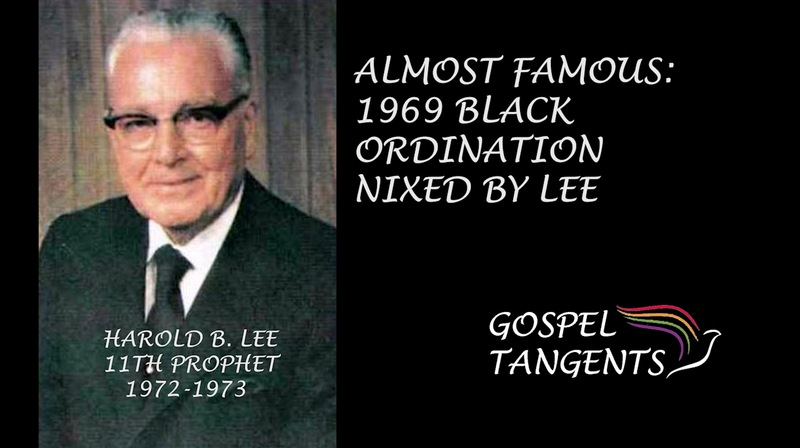 We will also get into more detail on Monroe Fleming’s “almost” ordination in 1969! Pres. Kimball Announced a new temple in Brazil to get buy-in to help apostles understand why ban needed to be lifted. Check out our conversation! Don’t forget to listen to Matt describe how McKay almost ordained Monroe Fleming in 1969. Despite several attempts to end the ban in the 1960s, Hugh B. Brown made one final attempt in 1969 and almost succeeded. However, the attempt was nixed by Harold B. Lee. Dr. Matt Harris will give us more information on this, and I think you will hear some really amazing stuff in this next episode. Matt: Anyway, the McKay sons and Brown, when Taggart’s thesis comes out, they will use Taggart’s research and say, “Look. This is just a policy. This is a policy, it is not a doctrine. So, if it is just a policy, President McKay, then we can overturn this.” President McKay agrees to ordain a black man named Monroe Fleming, a loyal member at the Hotel Utah. This is in September of 1969. Matt: Yes, yes. So, he agrees to ordain Monroe Fleming to the priesthood. It is interesting, the document that I have that talks about this. It just says Monroe Fleming. It doesn’t say all persons of African ancestry. But you can only imagine that if you allow Monroe Fleming the priesthood, based upon his worthiness of course, then that means that other worthy black members of the church can now hold the priesthood. That’s how I interpret that. We will also talk briefly about some of the BYU protests where other teams were protesting the church’s stance with blacks and the priesthood and temple ban. GT: He calls the Stanford University president. Matt: Yes, he calls the Stanford president and tells him we are going to lift the ban, and even writes him a letter. GT: The reason why is because Stanford had just cancelled some sort of a series. GT: Was it football or basketball? Do you remember? Matt: Basketball, I think it was basketball. It was that fall, they cancelled their contract with BYU basketball. Check out our other conversations with Matt, like Brown’s previous attempts to end the ban. Check out our conversation….